My confession: I am musically addicted the idea of making something new in my music out of something old and preexisting. I’m not alone, either–the practice of writing a new piece using the materials of an older work is almost as old as the act of composing, itself. I think of it like a sculptor might, if that artist could take the clay a great master used in a piece and reshape it into his or her own newly personal work. Fortunately music isn’t made out of immutable solids, but exists on a page in abstract as a set of instructions to the performer to recreate sounds and ideas. The title of my string orchestra piece “Virtuosity” was inspired by the programmatic theme of the 2013 Lake Champlain Music Festival. This piece started with that title, as I was also thinking of the concept of virtuosity already as it related to the East Coast Chamber Orchestra, an extraordinary ensemble comprised of all-virtuoso players. I decided that the best way to explore the idea was to make a piece made of “micro-concertos,” so that I could express virtuosity in different ways with each string instrument. The piece is built on the format of the Baroque Concertino, with parts for a core group of soloists surrounded by a larger ensemble. The first micro concerto is for two violins (like the Baroque trio), and follows with solo viola, cello, and contrabass, with some movements eliding into each other without pause. 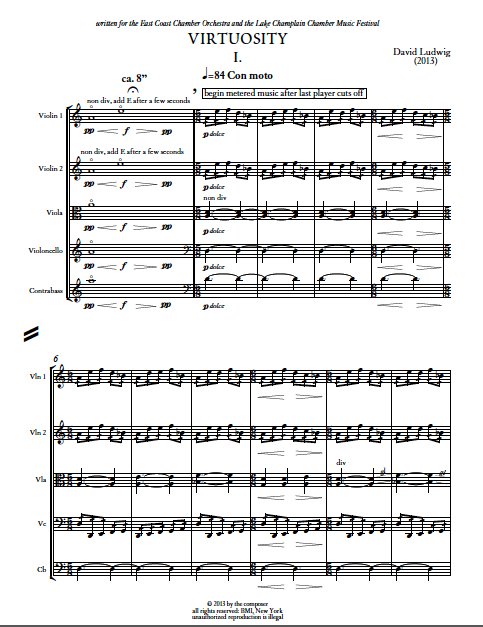 The final movement is a concerto for the whole orchestra, including a double fugue for the ensemble and then soloists in the middle of it (the fugue as a form is about a kind of compositional virtuosity that has challenged composers for hundreds of years). OK, then (who skipped?). By many accounts, the first truly canonic virtuosic work is the famous Chaconne from Bach’s 2nd Violin Partita, and this is a piece that lives with all musicians, not just violinists. For me, it was the final ingredient to writing “Virtuosity;” an work familiar to everyone that I could use as the source for my piece—the old master’s clay from which I could sculpt my own work. The “Chaconne” is not just virtuosic in the fingers; it demands that the performer change expression, color, and approach constantly over the course of the long arc of the musical narrative. Everything in “Virtuosity” draws from this one epic movement by Bach that would define string playing forever after. And in some sense, this piece is a reverse variations, where the theme of whose many iterations you’ve been listening to all along–is revealed at the end.